H-C Chang, LY Yeo. Electrokinetically Driven Microfluidics and Nanofluidics, (Cambridge University Press, New York, 2010). ​M Miansari, JR Friend, LY Yeo. Enhanced Ion Current Rectification in Two-Dimensional Graphene-Based Nanofluidic Devices. Adv Sci 2, 1500062 (2015). M Miansari, J Friend, P Banerjee, M Majumder, L Yeo. Graphene-Based Planar Nanofluidic Rectifiers. J Phys Chem C 118, 21856–21865 (2014). Ionic or corona wind, generated when a sharp electrode tip is raised beyond a threshold ionisation potential (just like lightning), can be directed towards a liquid surface slightly below the electrode to produce surface and bulk liquid recirculation in a small cylindrical microfluidic chamber as a consequence of interfacial shear. Recently, we demonstrated how the surface vortices can be used to drive efficient micro-mixing, as shown in the movie. This is extremely useful, for example, in high throughput screening microarrays in order to overcome the long times associated with microscale diffusional transport. The same micropipettes that deliver the reagents can be used as the sharp electrode tip to generate the ionic wind. In addition, it is also possible to use the surface vortices generated to trap microparticles, as depicted in the movie. The particles are drawn into the vortex streamlines due to positive dielectrophoresis and subsequently migrate towards the centre of the vortex due to shear gradients. This particle concentration mechanism is useful in biosensor technology due to the limitations of current biosensors to detect small amounts of pathogens. An alternative mechanism for particle trapping is to employ the bulk liquid recirculation. Curiously, a similar phenomenon occurs in stirred tea cups - the tea leaves are observed to accumulate in the centre at the bottom of the tea cup instead of being expelled outwards. This paradoxical behaviour was explained by Einstein in 1926. He showed that the friction at the bottom of the tea cup generated an inward radial force in a thin layer just above the cup's base. This together with the azimuthal rotation at the top surface gives rise to a spiral-like flow trajectory, which is known as Batchelor flows, named after GI Batchelor, who showed that a similar flow phenomenon occurred in a liquid column trapped between stationary and rotating disks. Particles in the flow follow the liquid trajectory and are spun down in a similar fashion towards the base of the chamber in the centre. If the sedimentation forces are sufficiently large to overcome the convective forces, the particles remain trapped at the base instead of being recirculated with the liquid back up a central spinal column. This bulk recirculation phenomenon is used to effectively separate red blood cells from plasma in a tiny device. This microcentrifugation technology is hence useful for the development of miniature chip-scale devices for point-of-care diagnostics. DR Arifin, LY Yeo, JR Friend. Microfluidic Blood Plasma Separation Via Bulk Electrohydrodynamic Flows. Biomicrofluidics 1, 014103 (2007). LY Yeo, JR Friend, DR Arifin. Electric Tempest in a Teacup - The Tea Leaf Analogy to Microfluidic Blood Plasma Separation. Appl Phys Lett 89, 103516 (2006). LY Yeo, D Hou, S Maheshswari, H-C Chang. Electrohydrodynamic Surface Micro-Vortices for Mixing and Particle Trapping. 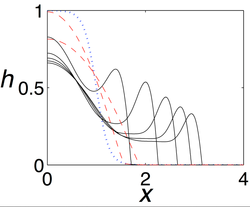 Appl Phys Lett 88, 233512 (2006). JJ Qin, LY Yeo, JR Friend. MicroPIV and Micromixing Study of Corona Wind Induced Microcentrifugation Flows in a Cylindrical Cavity. Microfluid Nanofluid 8, 231-241 (2010). If Research is Your Cup of Tea, this Eureka Moment will Stir the Blood, The Age, 16 August 2008. Einstein's Tea Leaves Cause a Stir in Medical Circles, ABC Catalyst, Television Broadcast: 19 July 2007 (Australian Broadcasting Corporation). 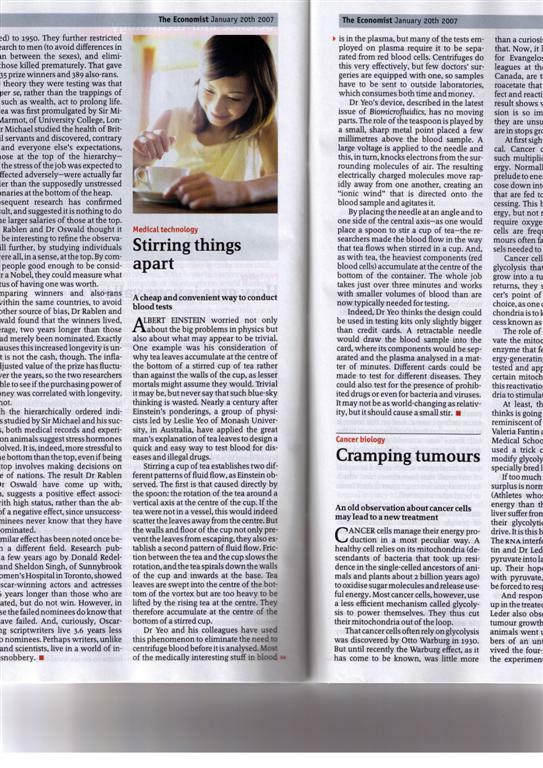 Stirring Things Apart, The Economist, 20 January 2007 (Print Version). Taking Blood Cells for a Spin, ScienceNOW, Science Magazine Daily News, 18 January 2007 (American Association for the Advancement of Science). Einstein's Tea Leaves Inspire New Gadget, ABC Science Online, 17 January 2007 (Australian Broadcasting Corporation). Electrospraying or electrohydrodynamic atomisation using high frequency (>10 kHz) electric fields exhibit significantly distinct behaviour compared to DC or low frequency AC electrosprays. For moderately high conductivity fluids, the characteristic sharp conical meniscus, known as the Taylor cone, in DC electrosprays is not observed. Instead, the meniscus resonates vigorously at a frequency corresponding to the inverse of the capillary-inertia time scale, periodically ejecting droplets via a tip streaming mechanism or from the tip of a long slender microjet. Due to the high frequency of polarity reversal, there is insufficient time for charge separation and subsequently double layer tangential conduction to occur within the meniscus. As such, there is no charge accumulation at the meniscus tip to produce the focussing mechanism for the formation of a sharp conical shape. In addition, a consequence of this is that the 1-10 μm order ejected drops do not carry net charge. These electroneutral drops, which are of the correct size for maximum dosage, is therefore suitable for pulmonary drug delivery, wherein charge drops which lead to surface adsorption and compound ionisation effects are undesirable. The absence of charge also renders the current and hence power requirement for the device low, which then makes the device suitable for miniaturisation. By using a biodegradable polymeric excipient dissolved in a suitable solvent as the working fluid, it is also possible to produce 1-10 μm polymeric microparticles. We have also demonstrated the possibility of encapsulating water in these microcapsules using the electrospray. It is also possible to synthesize fibers made of the same polymeric material. The figures show a 10 μm thick compound fiber, a mesh or network of 1 μm thick fibers; the pore size of the mesh is adjustable. By encapsulating growth factors into the fibers, it is then possible to generate biodegradable scaffolds for tissue and orthopaedic engineering. The SEM images below also show the possibility of forming ordered 100 nm order polymeric crystalline structures. LY Yeo, D Lastochkin, S-C Wang, H-C Chang. A New AC Electrospray Mechanism by Maxwell-Wagner Polarization and Capillary Resonance. 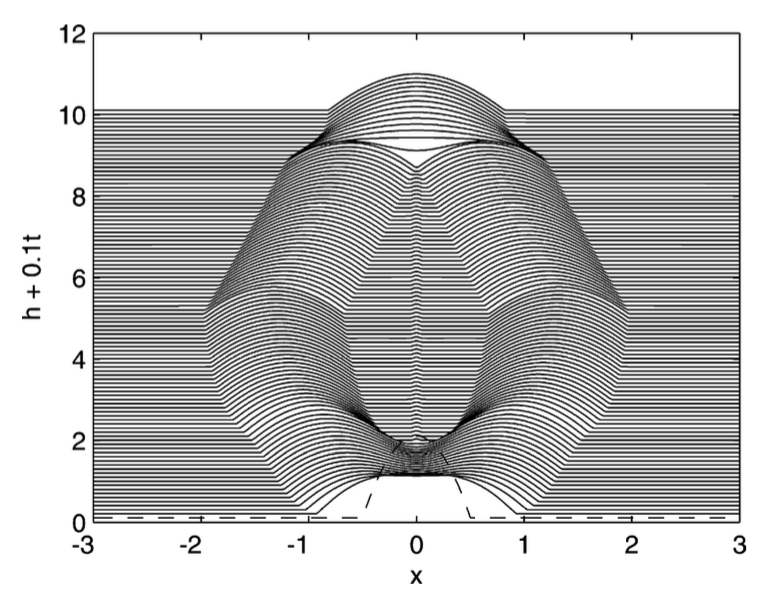 Phys Rev Lett 92, 133902 (2004). LY Yeo, Z Gagnon, H-C Chang. AC Electrospray Biomaterials Synthesis. Biomaterials 26, 6122 (2005). LY Yeo, JR Friend. Electrospinning Carbon Nanotube Polymer Composite Nanofibers. J Exp Nanosci 1, 177 (2006). Electrowetting employs an applied electric field to move liquid drops and films. It is therefore a precise, rapid and accurate means for liquid actuation in microfluidic devices. Our work on electrowetting has largely been theoretical in nature, in which we attempt to elucidate the physical mechanisms governing the electrowetting behaviour of drops lying on solid substrates. We advocate the delineation of two distinct electrowetting phenomena, which we classify as static electrowetting and spontaneous electrowetting. Static electrowetting describes the phenomena observed in electrowetting-on-dielectric (EWOD) and electrowetting-on-insulator-coated-electrodes (EICE) schemes, in which the macroscopic contact angle of the drop is altered by the application of the electric field, which is predominantly normal to the drop interface and becomes weakly singular in the contact line region whose length scale is of order the dielectric film thickness. Since the field becomes divergent only in this very small region, the behaviour can be described by a force balance at the contact line, which means that there is no dynamics associated with the system, i.e., it is in static equilibrium wherein the drop simply relaxes to its new equilibrium state with a contact angle described by the Lippmann condition once an electric field is applied. ​On the other hand, spontaneous electrowetting involves the spontaneous formation of a thin 10 μm order electrowetting film that is pulled out from the macroscopic liquid drop, as depicted in the spatio-temporal film evolution profiles in the figure. This electrowetting film advances along a pair of parallel line electrodes much faster than the macroscopically spreading (due to capillarity effects) drop itself. We show that the formation of this electrowetting film is analogous to gravity-induced films since the Maxwell electric body force acting on the contact line behaves in a similar manner to the gravitational force. As such, the film spreads in a self-similar manner similar to gravity spreading films. This dynamic situation, in contrast to static electrowetting, arises because of a non-localised and non-singular electric field gradient, tangential to the interface, which extends into the bulk of the liquid drop, thereby creating bulk pressure gradients that give rise to spontaneous liquid flow. LY Yeo, H-C Chang. Static and Spontaneous Electrowetting. Mod Phys Lett B 19, 549 (2005). LY Yeo, H-C Chang. Electrowetting Films on Parallel Line Electrodes. Phys Rev E 73, 011605 (2006). LY Yeo, RV Craster, OK Matar. Drop Manipulation and Surgery Using Electric Fields. J Colloid Interface Sci 306, 368 (2007).